"Wot's faster than a warbuggy, more killy than a warbike, and flies through da air like a bird? I got no bleedin' idea, but I'm gonna find out." And this gem from DoW2, if an ork gets knocked away... "I CAN FLLYYYY AAAAARGGGHHH!" 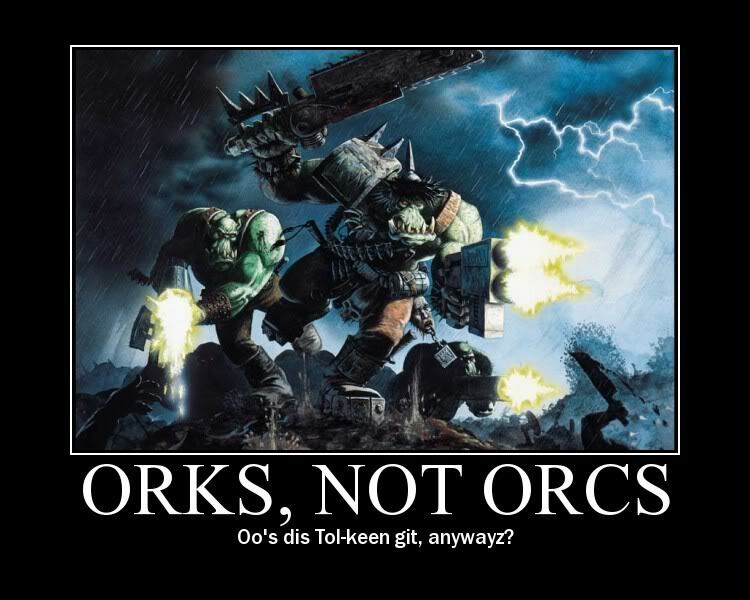 Ork logic at its best! OI, WUT 'APPENS WHEN YOU REPLACE A 'IGHT BULB WIF A SHOOTA? XRuinX, Primus, Fino and 1 other person like this. Keridunn and Admari like this. 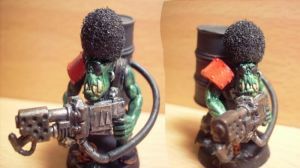 Grukk, Ork Boy We don't fight fer food, or fer teef, or guns, or cos we's told to fight. We fight cos we woz born to fight. And win. Dok Gutslash------- Right, first I'll take those teef out for yer, dat should help ease da pain in yer leg. Grokkit, hand me that wrench. Now then... Open wide, and say... AAARGH! DaKaptin, Kalgash Bloodaxe and Mr-Dakka like this. Kalgash Bloodaxe and Admari like this.